Easy Money. Orion Pictures 1983. Rodney Dangerfield should be able to play a slob pretty convincingly. It’s a large part of his persona. And all he has to do to inherit a windfall is give it all up. It’s an interesting conflict for an actor known for one personality to do a movie where he has to give up a large part of that personality. Vaguely like Jerry Lewis turning ultra-suave in The Nutty Professor. Beyond that (admittedly large) nugget I’m going into this movie pretty blind. I don’t know how it’s going to play out in any detail beyond a guess at the basic plot structure. Child photographer Monty Capuletti drinks, smokes, pops pills, gambles, ogles, and gorges. If there’s a vice invented by man, Monty does it. His mother in law, a rich department store mogul, does not approve. His older daughter is getting married, and he can’t even manage to bring home the wedding cake intact after a day of gambling, drinking, smoking, and toking. He doesn’t care much for his daughter’s fiance, but with some goading, he manages to be civil. Shortly after making a scene at the reception, he learns that his mother in law has died in a plane crash, and leaves most of her $10 million estate to him and his family, provided that within a year he completely cleans up his act. However, if he fails, the entire estate will revert to her assistant Clive, who throws every trick he can come up with to try to get Monty off the wagon. For such an irrepressible character as Monty, he is surprisingly very passive in the plot. He doesn’t want to take up the challenge, but his family goads him into it. His best friend Nicky and his younger daughter act as his reform coaches (the younger daughter is in fact the most proactive character once the money is on the table). Nicky suggests to him to go to the department store, and after they cause a scene there, Clive decides to have Monty consult on designing a new “Regular Guy” line of clothes as a prank. Monty ultimately decides he can’t finish the challenge, and events transpire that force him to do so anyway. Every plot-relevant decision Monty makes is countermanded by somebody else, as if the writers couldn’t trust the archetypal Dangerfield character to commit to the plot they wanted to stuff him into. While all of this is going on, there’s a largely unrelated subplot about Monty’s older daughter and her new husband. She runs out on him on their wedding night because she’s a virgin and too scared to consummate the marriage. This story would be cuter if Julio’s appearance and attitude about her issues (“Capuletti, I want my wife back!”) didn’t make him seem like bad news, but he makes up for it with his inept attempts to get her to take him back at her parents’ house. Of course, the entire movie is mainly a vehicle for Dangerfield’s talents, which explains why what everyone thinks of as the inciting action of the plot doesn’t happen until almost halfway through the movie. It’s more fun to joke about Monty’s bad habits than to show his troubles cutting them out. He’s in decent form, but not much that he did really stood out in a good way. At one point he sings “Funiculi, Funicula”, which may not have been the best idea, but at least he’s having fun. Some of the bad habits that don’t fit Dangerfield’s mold are more informed than shown. He’s supposed to be a pill junkie, but the only pills we see him pop could well be aspirin for a hangover. He smokes marijuana, but it’s hard to tell the difference visually from tobacco cigarettes and his actions are pretty much the same as being drunk. However, his drinking, gambling, lechery, smoking, and gluttony all get good play. 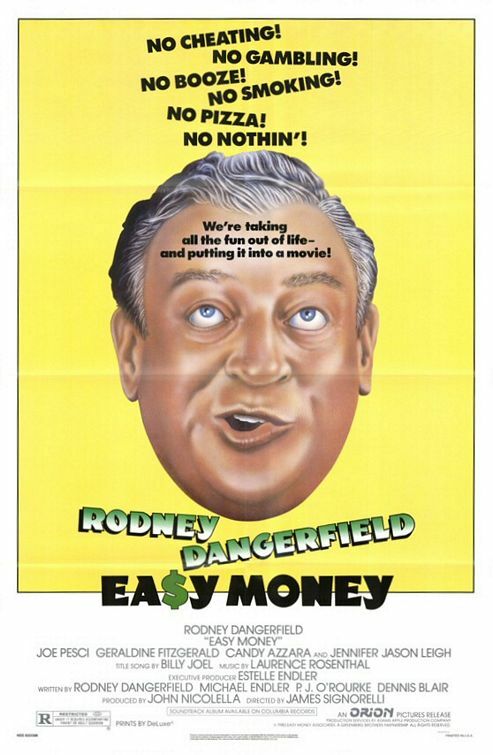 Watch this movie: to watch Rodney Dangerfield forced to try not to be Rodney Dangerfield. Don’t watch this movie: for the standard R-rated content.